To help assist in setting up your theme we have put together an XML file for you to import demo content that you will later replace with your own. It's important to understand before you import the contents of this file, that you have no intellectual property rights to use this content on a live website, you may use this “dummy” content for staging and configuration purposes. The images shown in the theme demos are not licensed for redistribution. Note: Prior to importing the XML, we do recommend that you install Genesis and any child theme, as well as install and setup any required plugins mentioned in the theme setup tutorials. 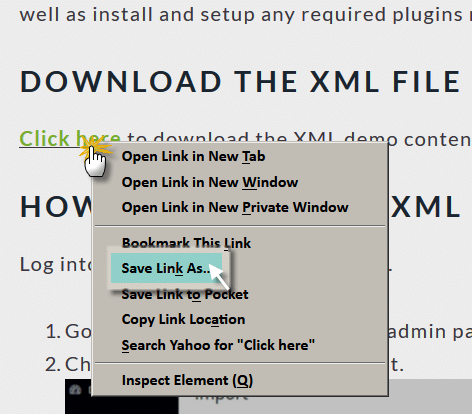 Click here to download the XML demo content file to your computer. *To download the XML file, right-click the link and select 'save link as...' and save to your desktop to upload as instructed below. Go to Tools: Import in the blog’s admin panels. Upload our XML file using the form provided on that page. You will then have the choice to import attachments, go ahead and select the “Download and import file attachments” box. 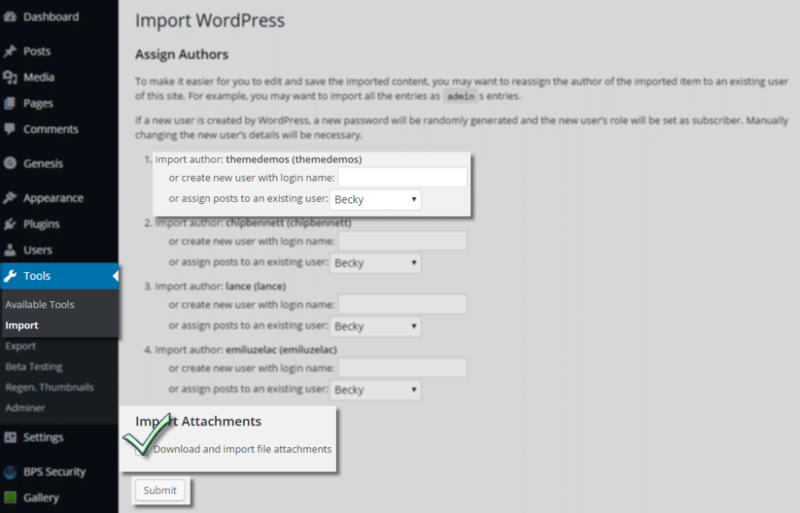 WordPress will import each of the pages, posts, comments, and categories into your blog. After you’ve imported the XML file, continue to follow your Theme Setup tutorial to set the theme up like the demo. Note: The import file contains the demo content for the pages, posts, comments, and categories, with placeholder images. The images shown in the demo are not licensed for redistribution with the themes. *To download the WIE file, right-click the link and select 'save link as...' and save to your desktop to upload as instructed in the plugin.